No Kneeling, Sitting or Prostrating! I feel my posts have all been quite serious so far in this one-month blogging challenge, and so I decided to share an embarrassing story I remembered after saying my morning prayers today. On 23rd September last year I had the joy of saying those morning prayers in the Shrine of the Báb in Haifa, Israel, a pleasure I had not enjoyed for some 14 years previous to that. When I travel to Haifa there are often a few fabulous coincidences in the experience and some moving facts or details being discovered, so as I set out to write the following I am not unaware that I am setting all the deep spiritual significance of a trip to the Holy Land aside in the name of entertainment, and I’m not sure I approve of doing that, so I will just move on quickly. From the gate to the bottom of the terraces at night. 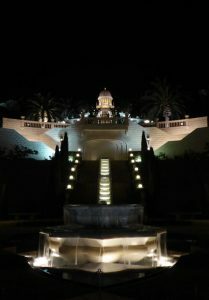 Arriving in the Haifa area is such a joy and the first thing I want to do is get to the Shrines there. I arrived at night so I had taken a walk to the foot of the Shrine and looked up at the lit up terraces from the locked gate, I tried to announce my location to friends via a Facebook live stream of what was in front of me but the mobile data connection I had wasn’t good enough. In the morning I got myself halfway up the mountain, registered myself as a visitor, and eagerly approached the Shrine of the Báb. Now, there are some things I need to explain here, probably even for my Bahá’í readers, for my story to make much sense. 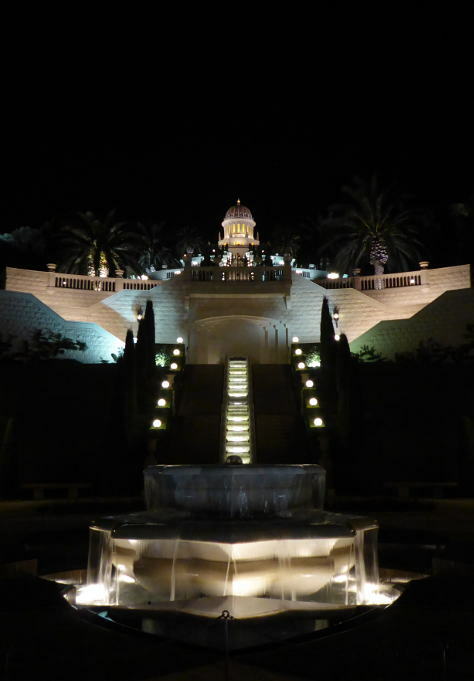 There are very few authoritative rituals or traditions in the Bahá’í Faith. When it comes to prayer, for example, there are a few prayers that have been “invested with a special potency and significance” by Bahá’u’lláh, and in two of those prayers there are some body movements involved such as kneeling, bowing and raising your hands, there are also some prayers that are frequently used in specific places or on specific occasions, though it is not obligatory to do so. Aside from this, Bahá’ís are not told how they should pray. We come from a wide variety of cultural backgrounds and what represents reverence, dedication or devotion can vary a lot, prayer is not led in the Bahá’í Faith, it is between the individual and God, so how we present those prayers is also our choice. Comment if this interests you and you want me to write a post about prayer. What Bahá’ís do have is actual prayers revealed by Bahá’u’lláh which are suitable for many situations, so it is possible to communicate with God using the Word of God. The reason I mention that there are “very few authoritative rituals or traditions in the Bahá’í Faith” is that there are nonetheless quite a few non-authoritative rituals or sayings that Bahá’ís sometimes acquire and pass on to each other. For example, in one Epsitle Bahá’u’lláh refers to the praise the city of Akka has received in the past, stating that the prophet Muhammad had previously said: “He that looketh upon the sea at eventide, and saith: ‘God is Most Great!’ at sunset, God will forgive his sins, though they be heaped as piles of sand. And he that counteth forty waves, while repeating: ‘God is Most Great!’ — exalted be He — God will forgive his sins, both past and future. As a result of this some Bahá’ís say that if you count forty waves in Akka you get great blessings, though Bahá’u’lláh did not actually suggest this would work today. But let me reiterate, while you are welcome to do this, there is nothing officially in the Bahá’í Faith to support this belief. Prayers that do officially have a special potency for difficult situations include the Tablet of Ahmad and the long Healing Prayer. Or the above prayer, said even once, still has a potency of course. It is not important, for understanding my story here, to know where this idea arises from (ie you can skip the next paragraph if it doesn’t interest you, but the following story related in Shoghi Effendi’s book, God Passes By, is most likely the source. Mirzá Áqá Ján was Bahá’u’lláh’s amanuensis (or secretary), he would record Bahá’u’lláh’s Words as He revealed them. So, having not so much thought about the source of this saying but feeling it couldn’t do any harm anyway, a prayer is always a prayer and a prayer said 500 times is – at a minimum – 500 attempts to say it the best you can. Even if “saying it” isn’t out loud, I was keen that on my first visit to the Shrine of the Báb I would say his most famous short prayer 500 times. That’s the first thing you need to know, the second is much easier to understand. At certain times of day the Shrine of the Báb is open for tourists. 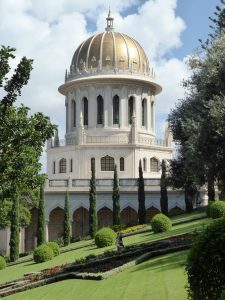 They are offered a leaflet in their own language about the Shrine of the Báb and the Shrine of Bahá’u’lláh, which also includes details of the other main Bahá’í properties in the area and an introduction to the Bahá’í Faith, including its basic principles such as the abandonment of all forms of prejudice; full equality between the sexes; elimination of the extremes of poverty and wealth; that science and religion should be in harmony, etc. Of course, the leaflet doesn’t go into how Bahá’ís come from all around the world and from different backgrounds and express prayers in different ways, it was very basic. The tourists would be met by a volunteer near the entrance to the Shrine and asked to take off their shoes before proceeding to the main entrance, it would be explained that silence should be observed in the Shrine and that photography is forbidden, another volunteer stands inside the Shrine reminding people of the latter when they start getting their cameras out. During these hours when the Shrine is open to tourists, visitors wishing to pray are also permitted to enter but are asked not to “sit, kneel or prostrate during this time”. The Shrine of the Báb, taken that morning. So, I was eagerly approaching the Shrine of the Báb on the first morning of my visit, fully aware that it was open for tourists and that I could not sit or kneel, and I had decided I would just stand in my spot, close my eyes to prevent myself being distracted by all the tourists looking at every detail of the Shrine, and subtely count off the 500 short prayers on my fingers behind my back. It takes a little short of an hour to do. 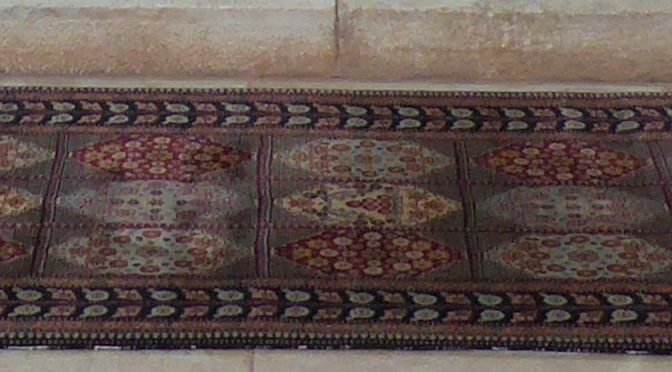 When one enters the Shrine they step into a carpeted room at the front of which is a threshold leading to a central chamber full of light, below which the remains of the Báb are buried. One remains in the same room (or at other times of day there are other accessible rooms) outside the central tomb chamber, but one does not cross the threshold into it, one generally prays facing it. These outer rooms have only a few items in them, and so those items often get a lot of attention from the tourists. From time to time, during my 500 prayers, I was aware of the tourists moving around me, and obviously when you know which way you are facing you can still have a pretty good sense of where people are in a room in relation to you while your eyes are closed, just based on what you are hearing, so at moments I would be puzzled as to why people sounded to be paying a lot of attention to a bare section of wall on the side of the room, but I tried to block it all out and complete my prayers. I did have one concern, I hoped that the slight movement of my fingers counting behind my back would not look like any kind of a ritual or confuse the tourists, I hoped that they would not be exiting the Shrine and asking a guide why the man praying in there is moving his fingers behind his back, so I kept the movement as slight as possible and was fairly impressed, as I approached the magic number of 500, that my system had not let me down. As my eyes sprung open again, prayers said, not let down by fingers, I realised I had been let down by my feet. I was no longer stood facing the threshold to the burial place of the Báb, I was instead facing that blank section of wall which I had assumed several tourists had taken an interest in. Having worried that the slight movement of my fingers behind my back might have been misunderstood as some Bahá’í tradition like the Jews bowing at the Wailing Wall, I realised that I had – in fact – spent at least the last part of my time praying toward a wall while the tourists walked around me learning about the Shrine. I think I probably said a few more short prayers facing the right way before exiting backwards – away from the threshold, not the wall – out of the Shrine and embarrassingly acknowledging the two guides with a nod and a smile, who returned the same. Of course, nothing was said to me of this incident, but the next morning when I popped to the Shrine of the Báb during tourist visiting hours, just to say a few short prayers, as I was walking in the guide came up to me and said that I would be welcome to sit while I prayed. This is great! I laughed. 🙂 We should always strive to have a sense of humor! This is very moving dear James – I smiled deeply, thank you for sharing. This was great. I enjoyed it very very much. Thank you for sharing it and providing the background for me to also share the deeper experience involved in that simple prayer.